Once upon a time, there was an evil mother, a beautiful daughter, and an attentive father…. The narrative of their lives starts when Boy runs away from the home where she was physically and psychologically abused by The Rat Catcher, and ends up in a small artisanal town in Massachusetts. In Flax Hill, MA, Boy meets and marries a local widower who has a daughter of his own, a classical, ethereal beauty named Snow. With the arrival of Boy’s own daughter, named Bird, Boy and Snow’s promising relationship becomes estranged and culminates with Boy sending Snow away to live with another relative. Throughout all of Boy’s and Bird’s life, perhaps with Snow’s as well, there are fantastical, sometimes terrifying events involving visions, mirrors and tapping into the “technically impossible” aspects of the world in which they live. Boy, Snow, Bird opens with the story told from twenty-year old Boy’s point of view. We are at once struck by her coldness, her emotional disconnect from events surrounding her and the seemingly heartless decisions she makes as her intellect supersedes her emotions. There are non sequiturs that jump out from the story in the blink of an eye and just as quickly disappear. The confusing episodes remind the reader of the demi-world between wakefulness and sleep, a place where a feeling becomes manifest as in a dream with the equal chance that it will be a nightmare. This is the part of the novel where Oyeyemi successfully casts her first spell, luring the reader/listener into the twilight of Boy’s world. The second section of Boy, Snow, Bird is told from thirteen-year old Bird’s point of view. Bird is precocious, inquisitive and vivacious, but impetuous and even a bit cruel. She is an aspiring journalist who is sharp enough to ferret out information even as she seeks to uncover the truth of the world around her. In the process of negotiating her burgeoning adolescence and dinner table politics, she strives to find her voice, test her boundaries, and wield her power. 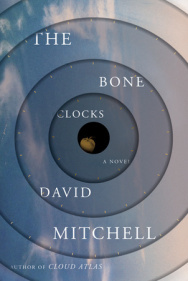 In this section, the clues as to what is really going on in this novel proliferate; but they are like the blue jewels set in the chain mail that Bird’s father makes: You can become mesmerized in the fairy tale references, without seeing how they connect to the whole of the narrative. When you see it, you can only marvel at the tale of enchantment that Helen Oyeyemi has spun. Susan Bennett and Cara Patterson are the two narrators in the audiobook production. Ms Bennett performs the role of Boy, while Ms Patterson voices Bird (and Snow in the instance of the covert correspondence that Bird and Snow take up.) Ms Bennett lends a clear, detached, and an entirely appropriate voice to the character of Boy; though apparently 1950s Manhattan sounded like Brooklyn; the relative isolation from New York made no impact on Boy’s accent after thirteen years; and she was immune to her New England neighbors. Ms Patterson’s approach to Bird is also commendable for its brightness and briskness, which matches Bird’s personality; though it suffers somewhat by being obviously more mature than her character, and in comparison to Ms Bennett’s more professional finish. 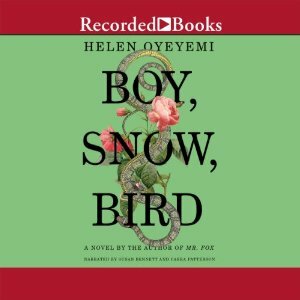 OTHER: I received a CD library edition of Boy, Snow, Bird (by Helen Oyeyemi; narrated by Susan Bennett and Cara Patterson) from Recorded Books in exchange for a review. I receive no monies, goods (beyond the audiobook) or services in exchange for reviewing the product and/or mentioning any of the persons or companies that are or may be implied in this post.